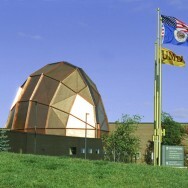 Weber Music Hall was completed in the fall of 2002 for the Department of Music on the Duluth campus of the University of Minnesota. The department was widely recognized for a quality program, but was hampered by the lack of a suitable performance facility. 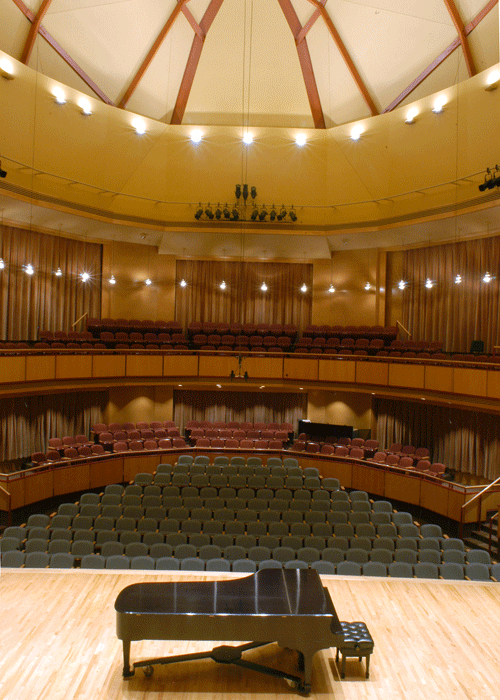 The University requested a state-of-the-art auditorium with flexibility and performance space for 70 musicians, a chorus of 60, and an audience of 350. Stretching the roof upward and displacing mechanical equipment rooms to the side and below grade achieved the required interior volume and functional utility within a small footprint. Meyer Borgman Johnson was a contributing partner throughout early development of the 23,500 square foot facility. MBJ engineers evaluated several structural solutions in response to the tight site and to the various challenges posed by the architectural design. 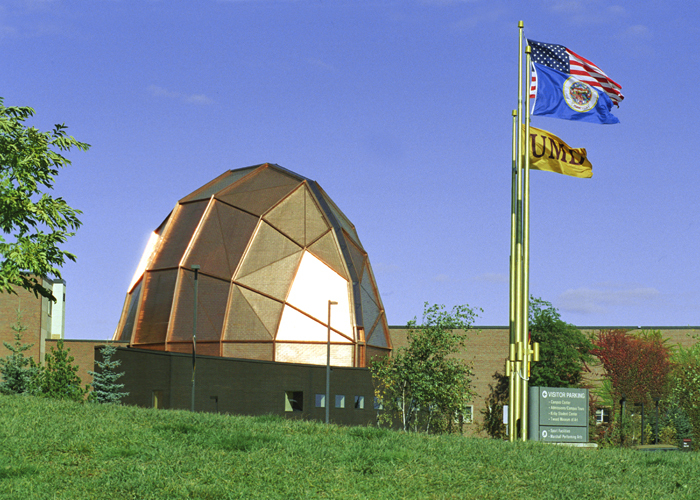 A steel frame was ultimately selected for the copper-clad “dome” and cast-in-place concrete with reinforced masonry for the balance of the structure. Initially working from hand-drawn schematic sketches, MBJ collaborated with the architects to develop a digital model of the complex “dome.” Selected structural members were exposed on the interior to create ribs and horizontal connecting elements on the ceiling. Visual distractions (including some structural members and building systems) were concealed within the structure between finishes. Following creation of the initial digital model, several design iterations resulted in a coherent structural strategy to satisfy the acoustic and architectural requirements of the program while simplifying the structure. 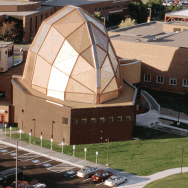 In its final design, the “dome” was broken into facets whose boundaries were expressed by wide-flange and HSS sections. 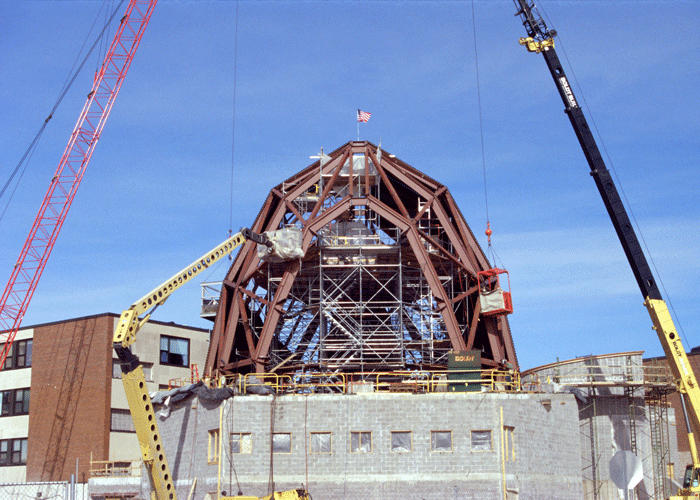 Most facets also contained hidden structural members to brace the panel and support the steel roof deck. 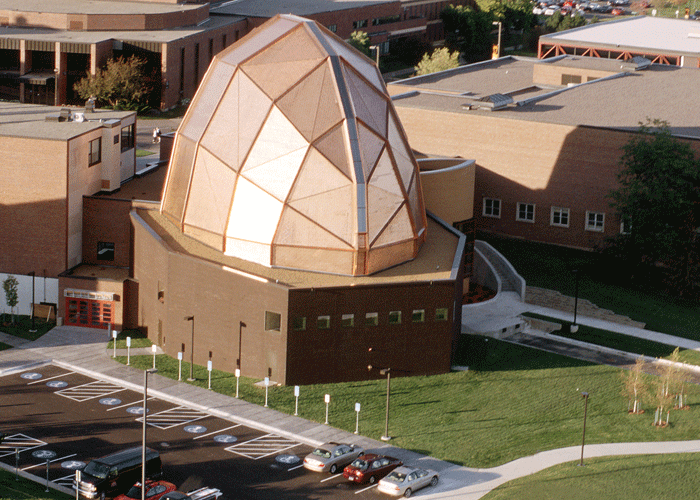 A system of plywood, insulation, waterproof membrane and copper shingles formed the exterior skin of the “dome.” The complex surface required nearly all structural members support roof deck. Design challenges included the multi-member structural connections at nodes and the need to maintain surface work-points for the different trades to attach systems and finishes. The digital model was imported into a three-dimensional STAAD file and analyzed for numerous load cases. MBJ designed all connections and provided construction details using simple connections that were easily adapted to the varying slopes and unusual member intersections. Connection design anticipated the need for a flexible erection sequence that provided greater safety during construction. 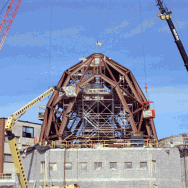 The simplification of connections also took advantage of the member organization created by the structural engineers. 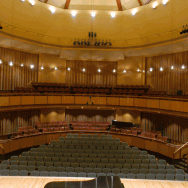 Additional features of the performance hall are the suspended orchestra canopy (acoustic cloud) and a linear two-foot wide skylight spanning 114 feet. Following award of the construction contract to Oscar J. Boldt Construction Company (Cloquet, MN), the digital model was shared with steel detailers Dowco Consultants Ltd. (Burnaby, B.C. Canada). Dowco generated three-dimensional images of connections that could be further modified by the design team to accommodate aesthetic and functional concerns before the structure was erected. Shop drawings were created from the model and supplied to the steel fabricator, Northshore Steel (Two Harbors, MN) for fabrication. The general contractor erected 120 tons of structural steel in approximately three months with minimal fit-up problems related to the steel frame.